"I'm always tense before races and it affects everyone as well. Even before the men 3,000m final in Istanbul, I was so nervous at the warm-up that I was thinking if there were a replacement, I would have gladly given up the chance to him." - Kenya's Edwin Soi, talking about how he felt before the World Indoor 3,000m final where he nipped Mo Farah for the bronze medal. Soi also talks about his collision with Farah and his team tactics with silver medallist Augustine Choge . Males: Would you rather be 5'1, or 6'10? Which is worse? 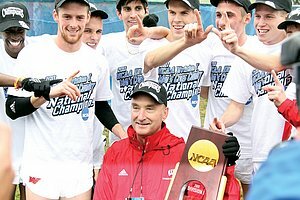 Will the class of '08 graduate without any NCAA D1 champions in the true distance events? Update: Alan Webb's Excellent Advice To Robby Andrews On Turning Pro "If you really love it, then it's worth it. But if you don't love the sport, then you're going to hate it as your job. It is a job. It's not your college team anymore. You're going to be getting a paycheck for this, so you got to love doing it." The Next Andrews? NJ Junior Ben Malone Sets Jr. Indoor Record By Running 1:49.91 Hard to believe that that's #2 all time indoors for HSers (only behind Andrews at 1:49.21). 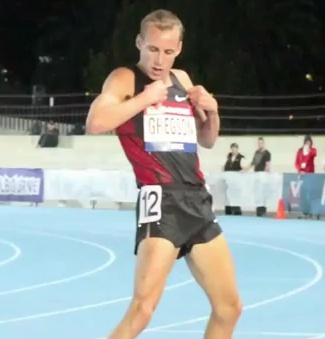 Ryan Gregson Talks About The Tons Of Media Exposure He Got After Aussie Trials Win "I'm tired. I don't think I've ever done that many much media in a 16 hour period before in my life." 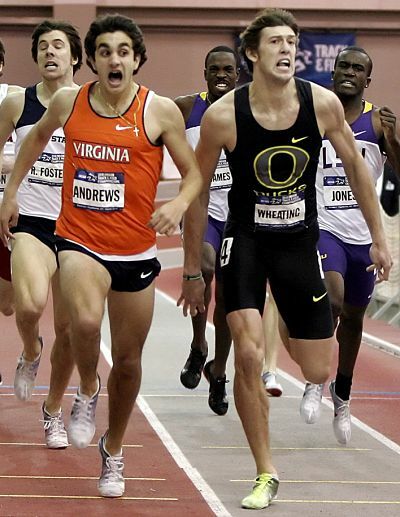 Recommended Read Meet NCAA Mile Champ Chris O'Hare Of Tulsa Running Times has done a nice feature on the Brit who seems like a great guy (and sibling, as he misses his bro and sis back in the UK). His coach says something we love: "Strength is synonymous with speed." Ryan Gregson Apologizes To LRC Fans, Wishes His Finish Line Dance Was Better "I just wish I could have put in a better performance. 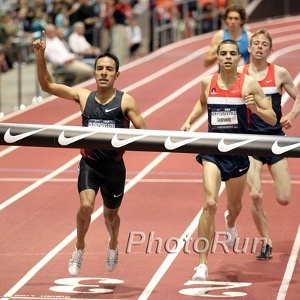 My legs were pretty lactic so I didn't nail it as good as I'd have liked." Recommended Read: LA Times Runs Nice Feature On Blind LA Marathon Runner "Though he didn't like running, he wanted to prove a disability couldn't stop him or others like him. 'I don't know if you've noticed or if you knew, but in the blind community, there are so many people that are couch potatoes, who are not doing anything with their life. There's so much that they can do.'" USA Masters Indoor Champs Are This Weekend More than 100 reigning World Indoor and Outdoor Masters champions will be among the more than 800 athletes ages 35-95+ on hand for the USA Masters Indoor Track & Field Championships Friday through Sunday at the Harry Gladstein Fieldhouse in Bloomington, Ind. 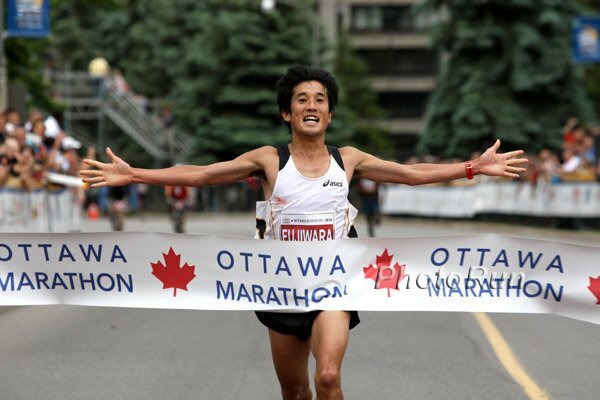 Japan's Olympic Marathon Team Is Released And LetsRun Hero Kawauchi Is Snubbed Kawauchi was the 1st finisher at one of the Trials races, admitted he didn't deserve to make it, but the selectors issued a special statement explaining why Kawauchi wasn't named as an alternate even though he was the top finisher at one of the three Trials races. 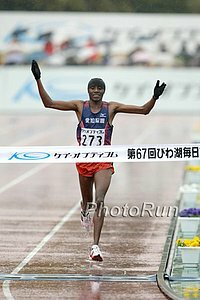 Japan Running News' Recap Of Last Weekend's Final Selection Race - The Nagoya Marathon 2000 Olympic marathon champ Mizuki Noguchi captivated the nation for a while, as after falling off the pace at 17km, she re-took the lead at 30km but ended up 6th in 2:25. British Olympic Association Chairman Lord Moynihan Worried Lifetime Ban Might Be Overturned "I'll be disappointed if we didn't win because we fought hard to represent the interests of the athletes. 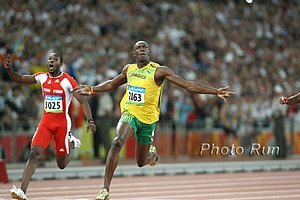 The findings may well dwell on fine points of law rather than the very strong moral arguments that are on the side of the athletes." Or Is He? Another Paper Says Moynihan Is "Cautiously Optimistic" On Retaining Anti-Doping Bylaw Following CAS Hearing "We represent the athletes, who have always voted that we take a tough line on those who knowingly cheat. We have had this bylaw in place for 20 years and it has always had the full support of the athletes." After Helping Team To Indoor Gold, Christine Ohuruogu Admits "I didn't really want to come here. I don't like indoors very much." HJ World Champ Returns To Greece & Rips Govt. For Cutting Support For Training Expenses Doesn't in some ways his win prove his argument is invalid? "The conditions there are unacceptable and facilities are a big problem. There is lack of heat in the winter and air conditioning in the summer." GB Coach Charles van Commenee May Name Cuban-Born Yamilé Aldama As Olympic Captain To call her a "plastic Brit" would be a bit unfair, as she's been in the UK for a long, long time. 4th-Place Kenyan Team To Arrive Back In Kenya Tuesday Morning To Hero's Welcome Not sure why they are getting a hero's welcome when Ethiopia beat them in the medal count. LRC Hellen Obiri Stuns Four-Time World Champ Defar link fixed Obiri Closes In 4:06.6 For Gold Get used to the name Hellen Obiri. Last year, she ran internationally for the first time and won the Kenyan 1,500m championships. This year, in the fourth 3,000m of her life, she came from behind to stop Meseret Defar from getting her 5th world championship. 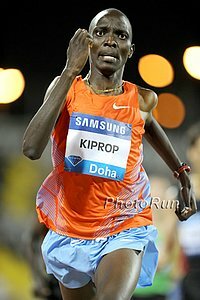 Good Read: Edwin Soi On Short List Of Kenyan Runners Who Have Not "Received Their Due Acclaim" He has a 5,000m Olympic bronze from 2008, an Afircan Games gold, and now a bronze from World Indoors. 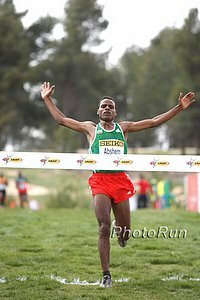 A lot of good quotes from Soi as he talks about pre-race nerves, his collision with Farah, and Kenyan team tactics as he and Augustine Choge took it out fast to thin out the "1,500m runners who could sprint fast in the end." A Look At The Kenyan Team As They Get Ready To Defend Their African XC Title This Weekend On paper, Daegu 3rd placer Vincent Chepkok is the top runner. Steve Cram "Concerned" With Mo Farah's World Indoors Performance He is very concerned with Mo's confidence, but as we, Van Commenee, and Bernard Lagat have all said Farah should not be worried. He is a 5k/10k runner and Worlds was a 3k. Olympic Stadium Covering Plan Abandoned; IOC Says "If it rains, you will get wet." Jessica Ennis Says She's No Longer The Favorite To Win Olympic Gold Many would argue that she hasn't been the favorite since she lost World Champs in Daegu. Injured And Need To Commiserate? 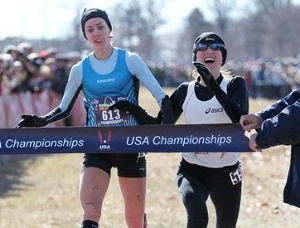 Lauren Fleshman Blogs About Frustrating IT Band Injury "If an injury drags on and on, you get progressively less excited when someone uncovers a new 'weakness' that might be the source of your problem. 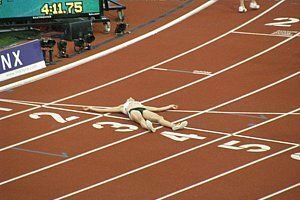 ... After enough time, even if the therapy is world class, you start to feel like nothing works properly and you can’t understand how you ever ran well in the first place. Sweet." Ridiculous: Kenyan Paper Says Tactical Mistakes Cost Their Men Gold In 800, 1,500 And 3k At World Indoors Kenya had zero men make the 800 final and Silas Kiplagat got beaten by 2+ seconds in the 1,500. 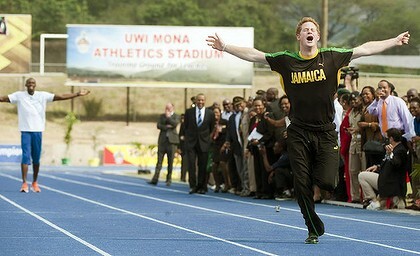 We're not sure how tactics would have resulted in gold in either race. Pamela Jelimo & Hellen Obiri Get Hero's Welcome At Kenyan Airport Jelimo was met by her mom and said she'll take a few weeks off. 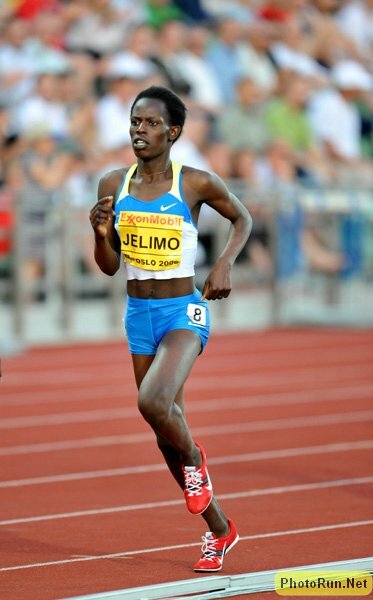 Jelimo Says She Still Has Work to Do: "As you can see I did not follow my normal procedure of front running all throughout in Turkey, this shows I am on course to building that trend." Brits Seem Horrified To Learn That 41% Of Olympic Stadium Workers Were Obese Many were skipping breakfast and so obsessed with food that accidents peaked right before lunch, until porridge breakfasts were offered for £1. Olympic 100m Champ Shelly-Ann Fraser-Pryce Tells Fans - Don't Be So Critical "We're not going to run good everyday. We're going to have a down day. But it's not that day for you to be telling us, 'Oh, you're worthless, you're not supposed to be doing that' ... instead of saying, 'Good luck next time. All the best when it comes again.'" After Improving Hip Flexibility, Arata Fujiwara Thrusts His Way Onto Japanese Olympic Team The woman who gave Fujiwara a one-on-one workout last month reveals the key to his 2:07: "When I first saw Fujiwara, I noticed his pelvis wasn't very stable. I tried to make sure his pelvic area was more relaxed - removing wasted energy to release that explosive power." If you think that article is over the top, then read this one, which is where the "thrusts his way" headline came from. 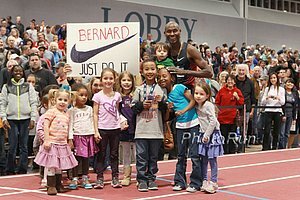 Bball Coach Makes Girl Run Laps; Father Beats Coach Unconscious - Only Stopped When Robert Johnson Steps In Truth is sometimes stranger than fiction. Athletics Kenya Head Is Justifiably Thrilled By Performances Of Golden Women Pamela Jelimo And Hellen Obiri AK now has two real London medal threats that were totally unexpected. Kenyan Team Getting Ready For This Weekend's African XC We loved this quote from last year's world junior XC champ Faith Chepngetich: "There is no difference between the World Cross-Country Championships and the Africa Cross-Country Championships, because competition is always between Kenyan and rivals Ethiopia and with the confirmation of Ethiopia runners to grace the championships, it will be as competitive as a World Cross because it will have the best." Curtis Beach: "It's really nice to win, but I'm really proud of the fact that I gave 100 percent effort in every single event." He Grew Up A Football Fan But Once He Started To Run, Something Clicked Inside Of Jeff Demps & Now He's Giving Up On NFL Draft To Pursue Olympic Dream The article says Demps, the NCAA 60m champ, would be a 3rd or 4th rounder. 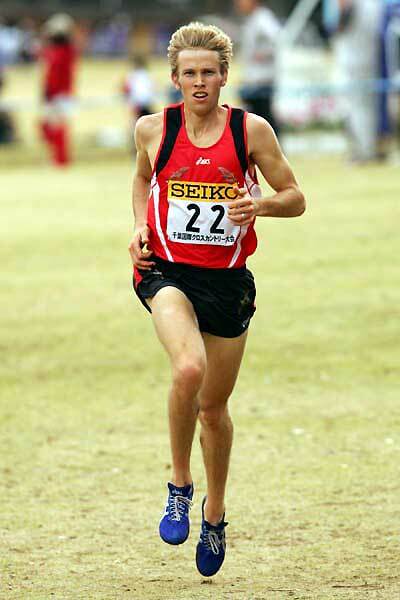 "Growing up, I was always a football player, so I never dreamed of running in the Olympics. But in high school when I started to run, something just turned on in me." NY Times Looks At "Plastic Brit" Scandal Involving Tiffany Porter We don't think knowing the national anthem is too much of a requirement. The athletes apparently disagree, as 1,500-meter runner Lewis Moses said: "Half the team don't know the first two lines of the national anthem." Justin Gatlin Pumped His 6.46 Winning Time Was The Same As His Pre-Drug Bust Winning Time "As a rookie, I came out and ran 6.46, and I came back as a 30-year-old man and ran 6.46." 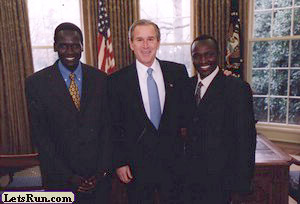 A Brief Chat With Iowa Grad And Burundi Olympic Marathoner Diane Nukuri Johnson The 2:33 marathoner is running the NYC Half next weekend. I was prowling around on some other running sites, and it's pretty clear that much of the running community hates LRC. Bored?? Check out my Band! Recommended Read: Excellent Profile On Katie Flood From Des Moines Register According to her mom, Flood ran a 6-something-minute mile with no training as an 8-year-old. More Practical Advice: I hate spring...allergies advice?